5-in-1 Jerry Chair is a Baby Orca underquilt with a silnylon outer covering, a pole pocket and channels all around. The suspension is the sliding type, through the side channels. 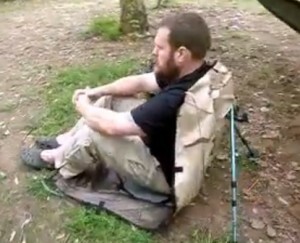 You can use it as an Underquilt, a Jerry Chair, a gear hammock, a pack cover or a ground cloth. If you want to purchase baby orca underquilt without the Jerry chair features – see baby orca product page.